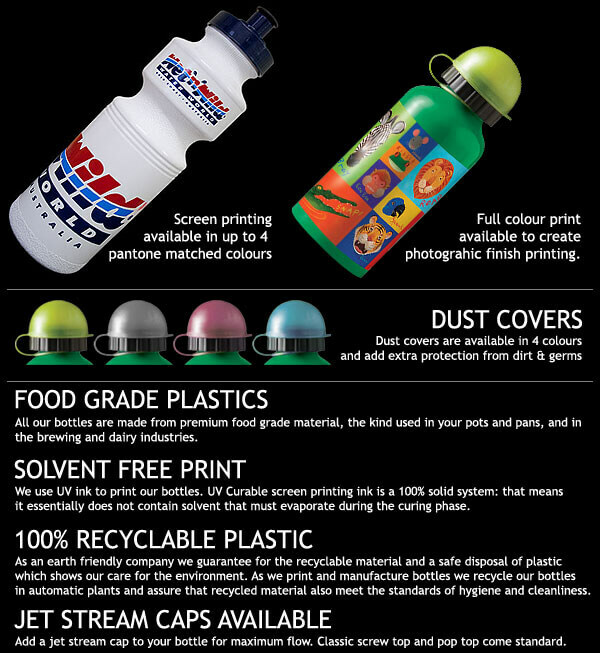 A great promotional bottle for sports and long distance use. When a smaller 750ml bottle just won't do! Manufactured in dishwasher and freezer safe plastic this bottle features a massive print area and a screw top lid in black or white. Clear with black or white lid. Keeping yourself hydrated is an important matter wherever you are and whatever you're doing. Unfortunately, although water is a basic necessity, it's also something that you might not be able to access in some places. Hence, it is essential for you to be prepared and bring with you enough supply of water wherever you are going. Considering that, you may want to find a water carrier you can bring anywhere you go. The 1000ml Monster Bottle can certainly deliver you both. "Something you can conveniently bring anywhere you go". There is a reason why the bottle is offered in this size, and that is to provide you enough supply of water to last you a full day. Aside from being designed to carry up to 1000ml of water, this monster bottle is also made from plastic that is freezer and dishwasher safe. Its screw top lid is available in white or black while the bottle is in clear Colour. There are several cases when it is great to have this Monster Bottle with you. It's also perfect if you drink a lot of water throughout the day and is a fantastic idea for whenever you are leaving the house or going out to travel. Of course, it's a convenient option for a water container which you can bring with you whenever going out for camping, hiking or even a simple road trip. With the amount of water it can carry, you will have enough water to keep you hydrated for the entire day. Aside from those mentioned above, there is one more instance in which this item can best serve for. What Dynamic Gift Australia offers is not just a simple bottle - it is specifically designed for promotional purposes. Nonetheless, those who are able to receive this promotional item can use it for any of the mentioned instances above. As a promotional item, the 1000ml Monster Bottle is manufactured in a manner which leaves enough space where printed materials can be placed on it. The good thing about purchasing at Dynamic Gift Australia is you can fully customise the design to be printed on the Monster Bottles. No matter what your promotional or business event is, this item will conveniently help in spreading your brand and creating awareness about your business. If you are interested to use and offer water bottles as one of your promotional items, Dynamic Gift Australia is here to help you. Minimum orders for this item is 100 units, so prepare well for your event and effectively spread awareness of your brand through the 1000ml Monster Bottle.